One of India’s largest mobile service providers Aircel has joined the fight to save India’s Royal Bengal tiger population from extinction.Save our tigers campaign, a great Aircel initiative by partnering with WWF India.Royal Bengal tiger, Indian National animal is in the state of extinction and there are only 1411 tigers left in INDIA which needs our help for survival. Join the Save our tigers campaign at Save Our Tigers. It is so sad to know that the expected number of tigers in India is continuously decreasing. The tiger population has dropped to a current total of 1,411 in comparison to 40,000 tigers a hundred years ago. According to the recent survey carried out in India, it is noted that there is a sharp decline in their population to 1,411. So friends, show your support for our national animal! Join the movement to stop India’s tigers from fading away. Save Our Tigers – an Aircel initiative in partnership with WWF India.Football player Baichung Bhutia, Indian cricket captain M S Dhoni and Tamil actor Surya roar for the ” Save Our Tigers” campaign. 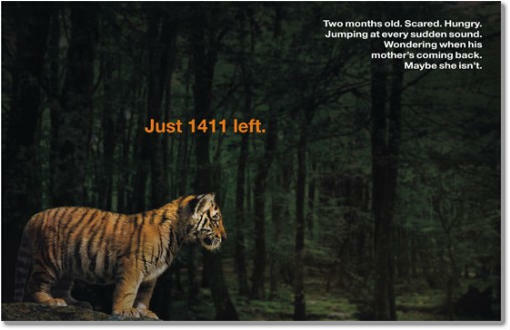 Watch above Save Our Tigers thematic TV ad. Show your support for our tigers. Speak up, Blog, SMS every little thing helps.All efforts are supported through the website as well as executions on Facebook, Twitter and YouTube.